ALL YOU WANTED TO KNOW ABOUT CRAB BUT WERE TOO AFRAID TO ASK! 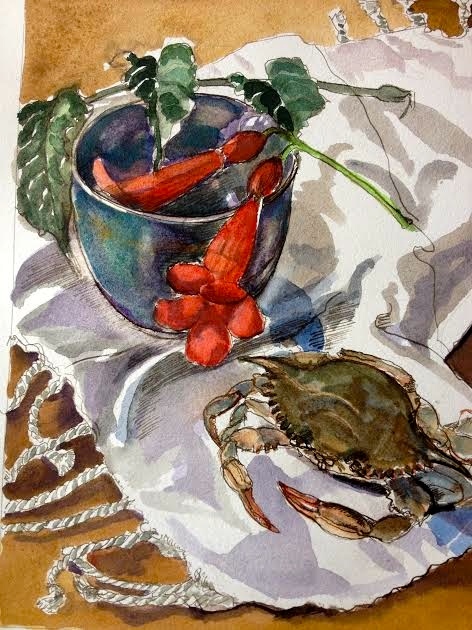 My good friend from across the pond, Bonnie Lalley has just kindly sent me her latest painting of a soft shelled crab she recently bought in Maryland where they are now in season. For me the crab has a strong link to seaside holidays of my youth, trips to see my brother at Uni in East Anglia – Cromer Crab..mmm! Food, as ever, evokes such strong memories for me. Crabs like lobsters are crustacean and in their edible form are normally sold with their hard carapace, but premium process are paid for ‘soft’ crabs, when the old has shell has been discarded but before the new one hardens – on the east and south coast of the U.S., the soft blue crab is a v. important industry. Crabs are seriously old in terms of life on this blue planet – they have been shifting sideways since the Jurassic period and they are everywhere – well not literally – that would make crossing our floor a little iffy! Of the order Decapoda – which also includes lobsters, prawns and shrimp – 4,500 of its 8,500 species are crabs. And they do not all scuttle sideways! There are swimming crabs and land crabs too – and they range from the pea-sized oyster crab to the rather scary giant Japanese spider crab which measures a healthy 3.6 meters from claw tip to claw tip! Might struggle to get that one in a pot! What is a pity that we do not eat enough crab in the U.K. Crab is cheaper than and just as tasty as lobster, and it’s also full of protein and omega-3 fatty acids, which help build muscle, protect against heart disease and support the immune system. The stomach-filling protein in crab sates your appetite and is used to build and repair body tissue. Crab is a great source of two beneficial long-chain omega-3 fatty acids, EPA and DHA, which have anti-inflammatory properties. Research suggests they help lower blood pressure, protect against heart disease, improve cognitive function, and reduce conditions such as psoriasis and ulcerative colitis. Minerals in crab, such as copper, zinc and selenium, support the immune system. So- eat more crab! Mind you, no wonder crab rarely appears on the home cook’s shopping list in this country. The “dressed” ready-prepared sort is often chilled into taste-destroying oblivion, shelled claw meat costs a king’s ransom, tinned crab is but a shadow of the fresh article, and the prospect of wrestling with an intact armour-plated crustacean can seem daunting to most folk. Shelling crab is actually pretty easy, and you’ll be rewarded with sweet, white claw flesh that knocks the spots off lobster, and brown meat that delivers the very essence of crustacean flavour. An easy way to deal with cooked whole crab is to break off the claws, put them in a strong plastic bag, and whack it with a rolling pin. This stops shrapnel from shooting all over the kitchen and you should then be able to pick the white meat from the shell. You can also eat the brown meat in the carapace, but make sure to remove the inedible, greyish gills first. Alternatively, use the carapace and legs to make a full-bodied shellfish stock. 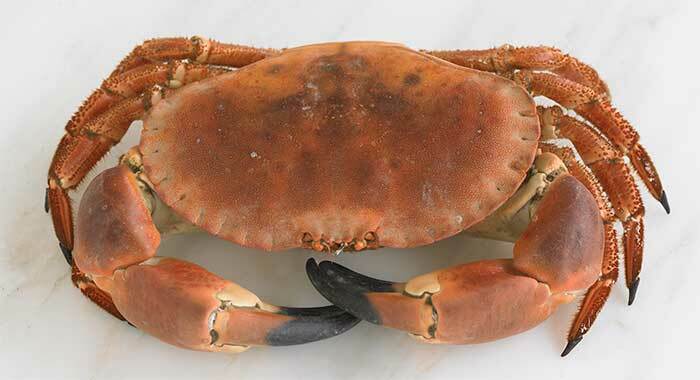 Crab in the UK is generally in season from May until November. Choose crabs that feel heavy and don’t have liquid sloshing around inside them. But whatever you do – grab a crab today! If you have not bought one in a while – or ever – go and do that today! Or as soon as is humanly possible! Here are a few crab recipes to get you inspired! This would be lovely baked in the crab shell, depending on whether you are using a whole crab and how big the shell is. If you are going to use the shell, wash it thoroughly inside and out and oil the outside a little. Preheat the oven to 200C/400F/gas mark 6. Mix the garlic, ginger, chilli, and lime juice with a generous pinch of salt to create a loose paste. Add the creme fraiche and stir well. Throw in the onion, fennel, crab, half the breadcrumbs and all but a tablespoon of the chopped coriander and mix thoroughly. Season to taste. In a separate bowl, toss together the lime zest, melted butter, remaining coriander and breadcrumbs. Pile the crab mixture into the shells, or a shallow ovenproof dish, top with the breadcrumbs and bake for 15-20 minutes until bubbling and brown. Serve with toast or warm crusty and a green salad. Start by making a flavoured stock called a court bouillon. Roughly chop the leeks, carrots, onion, celery stick and fennel bulb. Put in a large saucepan or stockpot with the garlic, and herbs. Add the rock salt, sliced lemon, white wine vinegar, star anise and wine. Add 3 litres water, bring to the boil and simmer for 30 mins. Cool and strain the liquid into a jug, discarding the vegetables. Return the liquid to the pot and bring back to the boil. Lower in the crab and simmer for 12 mins per kg, then leave to cool in the pot until cold. To prepare the crab, lay the crab on its back and twist off the front black-tipped claws. These contain most of the white meat. Put legs. Press your two thumbs either side of the eyes and push away the ‘purse’ (that is the central body part). On the underside you will see a circle of grey feathery gills called dead men’s fingers. It is crucial to pull these off and discard. They should not be eaten. Then, using a heavy knife, cut the round purse into four. This exposes the white meat, which can be picked out. Pull off the knuckles from the claws and pick out the meat with a skewer or small, sharp knife. Place the large claws on a worktop and cover with a clean towel. Smash down with the back of a heavy knife or mallet until the shell cracks. As an alternative method, placing a wooden board on top of the crab, then hitting the board with a large hammer, also works well. Peel off the cracked shell to extract the meat inside. There is a thin blade bone in the centre, which should be discarded – be careful, it is sharp. You can also push the meat out using your thumbs and fingers, checking at the same time for any stray bits of shell. Pull off the 6 legs. Don’t be squeamish! Extracting meat from the legs is fiddly, so unless you really need the meat, save them for a bisque. To check that there is no shell left in the white crabmeat, sprinkle the crab over a metal tray – you will be able to hear if any shell is left in. Using a teaspoon, scrape out the brown meat inside the main body shell, both soft and hard. Place in a sieve and rub through into a bowl using the back of a wooden spoon. Put the crabmeat in a glass or metal bowl. Check for any shards of shell. Tip the brown crabmeat into a small bowl. Stir in the crème fraîche and ½ the lemon juice until smooth. Lightly season, then set aside. Cut the tomatoes in half, or into quarters if large. Cut the avocado in half lengthways and remove the stone. Peel off the skin, then cut into thin slices. Put the rocket, tomatoes and avocado into a large bowl. Squeeze over the remaining lemon juice and the olive oil. Season, then toss until the salad is coated with the dressing. Arrange the salad onto serving plates. 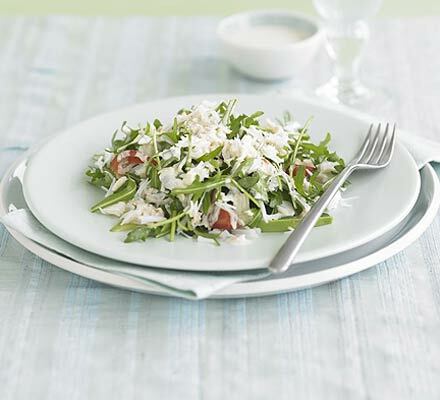 Scatter over the white crabmeat, drizzle with crème fraîche dressing and serve straight away. 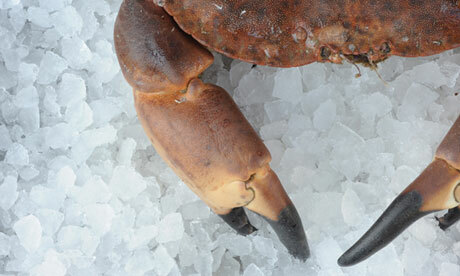 I hope you are inspired to go and grab a crab today – but watch out for those claws! Snowed in? You need a warming fish dish…! When I saw this latest painting by Bonnie Lalley – she has been enduring arctic temperatures and blizzards over where she lives in the States, poor thing! – I was put in mind of one of my favourite comfort fish dishes – one to curl up by the fire with and watch the snow fall outside – or in my case the pouring rain – and savour for its benevolence. 600 gm potatoes peeled and sliced – not too thinly! 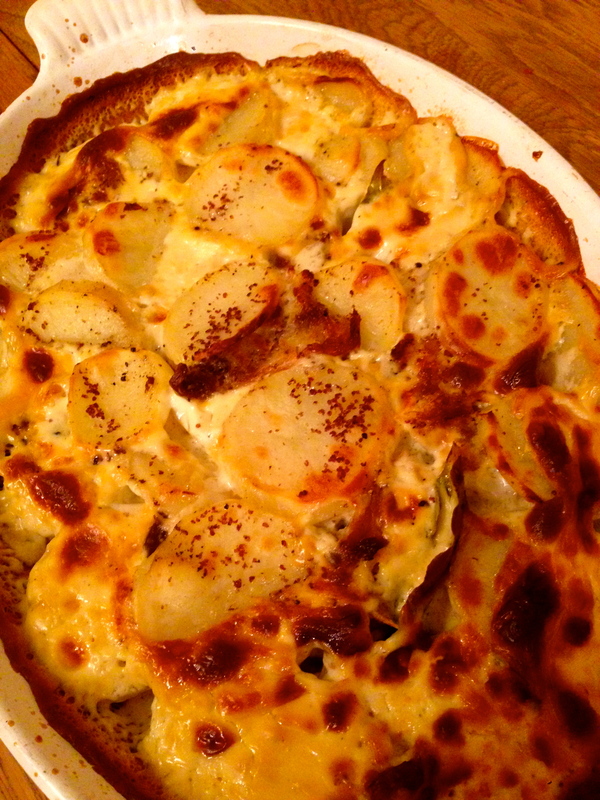 Arrange the potatoes in a shallow baking dish. Mix in the mackerel. 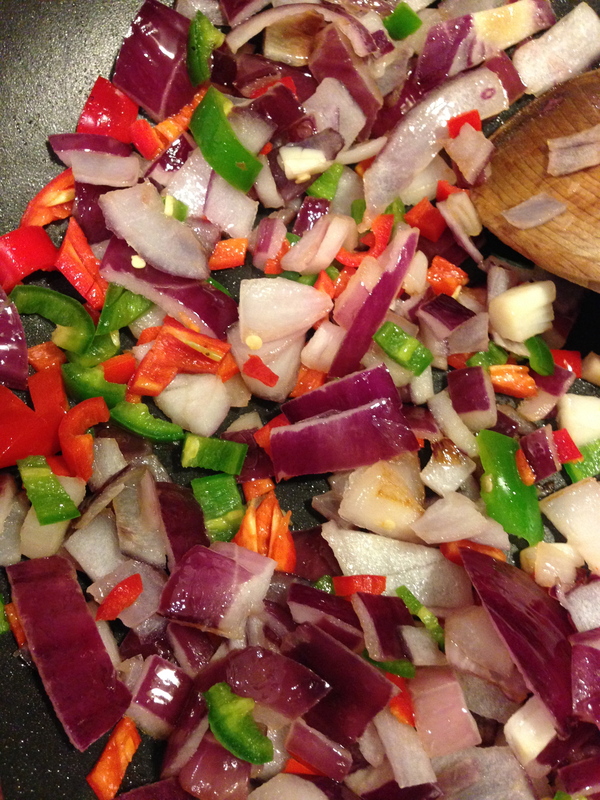 Add te bay leaves and a good grind or two of black pepper. Mix together the milk and cream and pour over the potatoes and mackerel. Bake in a preheated oven – 190c – for about 50 minutes to an hour. 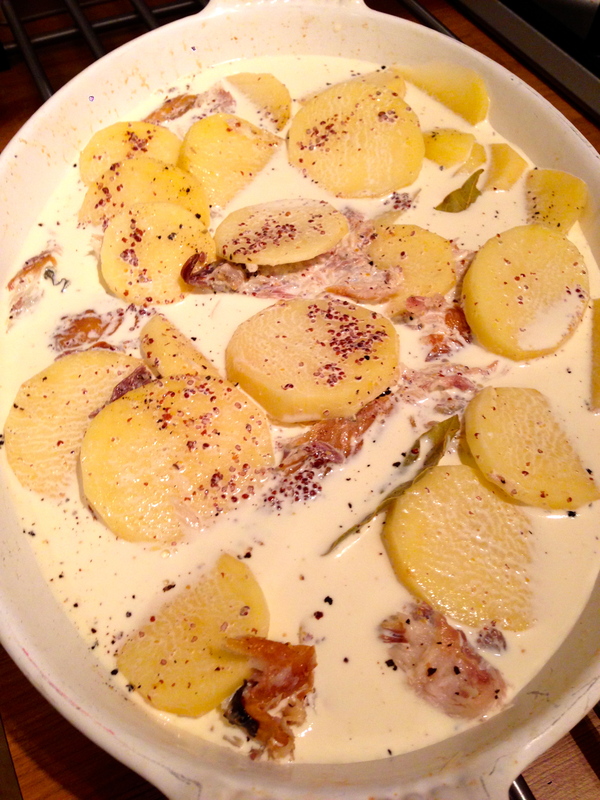 The cream mixture should be bubbling and the potatoes pierced easily by a knife. Serve with rocket and baby salad leaves with a swirl of balsamic over them and a little olive oil. The picture below does not do the dish justice – but last night it warmed us to the core – it is a dish that brings an instant sense of well-being to all gathered around the supper table. And there is a serene simplicity to this dish, just like the painting of the American farmstead snowed in. I am excited today…excited at the prospect of a new venture and a new partnership…a partnership with a wonderful artist and illustrator called Bonnie Lalley from the States. I feel,just like the painting, that I have fire in my hands! 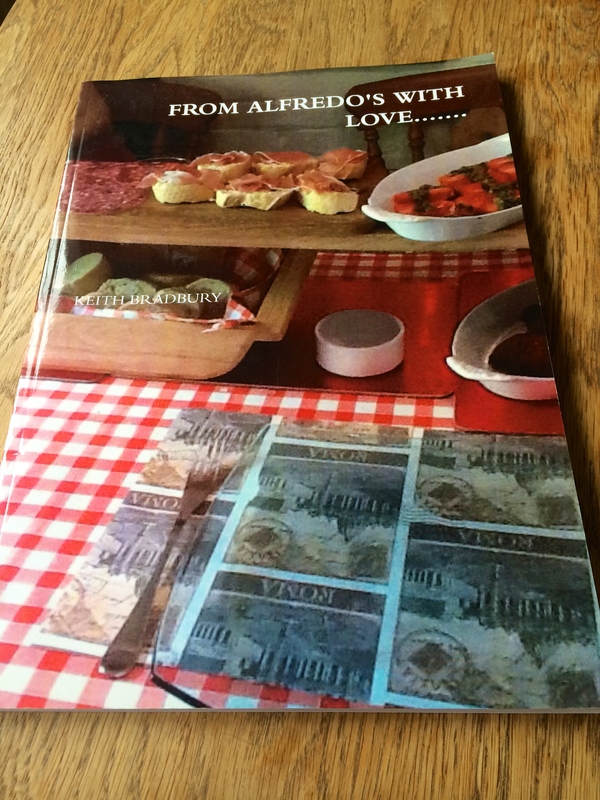 We have both been inspired by each others work – so much so that Bonnie will send me a painting inspired by my recipes or I will write… inspired by a painting she has sent me. So here we go…. When I first set eyes on this piece of work by Bonnie I was suddenly transported to Spain. I am heading out to Valencia in the summer – land of the late harvesting princely Valencian Orange. Sweet, juicy and warm in every sense, This hand is holding on tight to this precious cargo and no wonder…it is one of the demi gods of the citrus world. I was put in mind of a salad I had a few years ago out in Northern Spain….a simple yet satisfying and sensual salad centred around the Valencian Orange. Chopped walnuts or almonds or both! Right, for the vinaigrette pop all the ingredients into a small bowl. Whisk well and set to one side. Peel the oranges. Cut each orange in half, remove the pith and cut crosswise into 8 segments. Set aside. Divide the rocket onto four plates. Top with the orange slices. Add a few sprinklings of the chopped nuts-you could toast them too. Drizzle with the vinaigrette. Finish with freshly ground black pepper and serve. Oranges are a gift from God and a fruit we take for granted. We must not. We must hold them close and cherish them. And I want to end with a truly beautiful poem…a favourite of mine..and one that goes so well with this painting. I hope you enjoy our collaboration…who knows where it will take us!